For those who have been forced to defend their criminal or statutory innocence in the courts of our land there is no doubt that justice is the least important component of the litigation equation. Modern day courts are merely the battlefield whereupon people with uncalloused hands dressed in suits conspire to steal the children, the businesses, the personal and real property and freedom that working class people have worked their entire lives to accumulate and/or preserve. In all legal matters, your own attorney is not necessarily your friend and the opposing attorney is always your enemy. In civil matters the judge facilitates the transfer of wealth from one party to another. If the matter is criminal, the judge facilitates the state's intention to turn as many free Americans into incarcerated slaves as is possible. The United States has more people in prison per capita than any country in the world and, according to the U.S. Bureau of Justice Statistics, Idaho has the fastest rising prison population in the nation. Imagine every municipal, state and federal court in the nation open eight hours per day, five days per week. Imagine the millions of statutes that people have little choice but to violate (intentionally or otherwise); the 2,000,000 licensed attorneys arguing statutory violations in court and lobbying for the passage of more statutes in the legislatures of the land. Imagine the number of criminal convictions handed down every day and the cost of warehousing 2,000,000 Americans in the nation's prisons and jails. Imagine the thousands of estates that wind up in probate courts that claim up to 60 percent of the assets in dispute for the state. Imagine the bureaucracy that must be erected to handle the sheer volume of legal paperwork and the collection of agency initiated, court-mandated fines. Now try to think of an American industry that is bigger than the justice industry. In life, all pots of money are vulnerable to the schemes of greedy, unscrupulous people. No industry, however holy, is off limits to the aforementioned people. at the Burley City Hall, Burley, Idaho. In order to feed itself, the justice industry has given its officers almost total immunity for the actions of its officers. Bureaucrats are seldom held accountable for using their official capacity to injure people; attorneys are seldom held accountable for unethical professional conduct; and judges have given themselves near total immunity when they allow their courts to be used as a place where provably innocent people are ruined at the pleasure of others. Impartial justice is the cornerstone of our Constitutional Republic. Without it those of means, or those with the favor of the court, are allowed to plunder those of lesser means or lesser favor. Judges must be held accountable for their actions. They have proven that they cannot be trusted to make themselves answerable to the law. The legislature has proven it will not demand that judges be held accountable for their actions. Attorneys, most of whom aspire to become judges, will not demand judicial accountability. That leaves you, me and our friends and family. Accountability must be restored to our justice system. 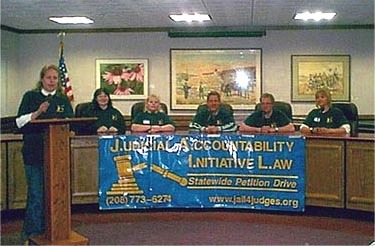 Judicial accountability is the logical place to begin. If impartial justice is the cornerstone of our Republic, and the cornerstone has crumbled, what then becomes of the Republic? More specifically, if the people are plundered to the point that they have nothing left to take (a time that is quickly approaching) what, then, will become of the Republic? From: The Idaho Observer, February, 2002, http://www.proliberty.com/observer/20020201.htm, accessed 04/12/03. The Idaho Observer is a constitutionally-oriented, monthly newspaper published in Spirit Lake, Idaho (see http://www.proliberty.com/observer). Photo courtesy of Scott Thurston. Reprinted in accordance with the "fair use" provision of Title 17 U.S.C. § 107 for a non-profit educational purpose.